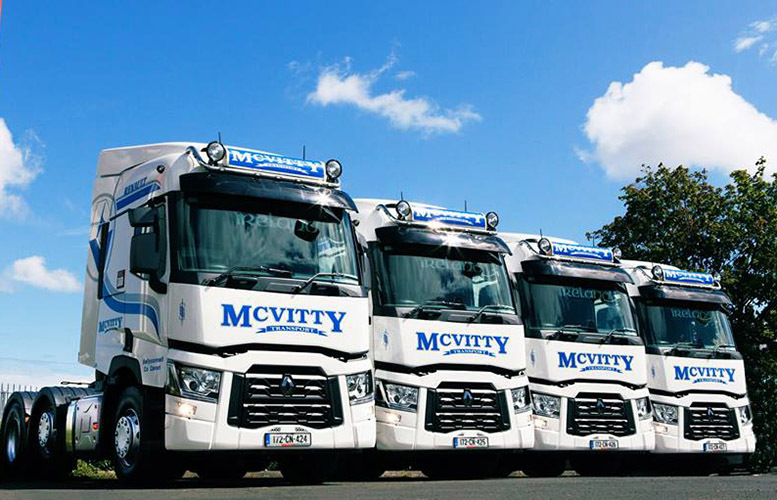 Approaching its 30th anniversary, McVitty Transport Ltd in Ballyconnell, Co. Cavan recently took delivery of four new Renault trucks which have been put to work drawing plastic, insulation and concrete products for the company’s three main customers. Purchased from Setanta Vehicle Sales in Dublin, the four T480 6x2’s represent a major capital investment by McVitty Transport, which is one of the leading transport providers in the border region. The latest 13-litre, 480hp high spec additions to the fleet are equipped with airconditioned leather seats, fridges under the bunks, top light bar with headboard and the McVitty Transport livery supplied by Coyle Complete in Carrickroe, Co. Monaghan, along with painting to match the other seven articulated trucks operating from the haulier’s yard in Ballyconnell. Working alongside the new Renaults are six Scania and a DAF 320. Four of the Scanias are 480s, there is one 580 and completing the fleet is a 22-year-old 143 450, which is a regular at truck shows (it recently made an appearance at the Dualla Truck Show in Co. Tipperary along with the four Renaults). McVitty Transport runs several curtain-siders and flat trailers, and also pulls a number of flats for O’Reilly Concrete. The family-run operation employs 14 staff (12 drivers) and carries out its own maintenance and repair work at its workshop. The premises also boasts an office, a large yard and warehousing facilities. It’s fair to say McVitty Transport has come a long way since Peter McVitty and his wife Susan set it up in April 1988 after local company Boxmore Plastics decided to privatise its haulage business. “They’ve always been a great company to work for. I started working for them in 1972 and I’m still working for them, albeit in a different capacity,”Peter enthuses. Boxmore Plastics is one of Ireland’s leading manufacturers of plastic containers, bottles and closures. Founded in 1961, it has extensive experience in the supply of custom-designed packaging to the food & drink, pharmaceutical, healthcare and chemical markets, including the supply of UN certified containers. Ballytherm is another Ballyconnell-based business which specialises in the manufacture and supply of effective insulation products to the Irish and UK construction markets. The company can supply insulation from stock or can produce bespoke boards to match the requirements of a specific project. Peter and Susan McVitty are joined in the business by their sons Hugh and Ronan. Their daughter Mairead was also previously involved before spending seven years in Australia. She has been working for Ballytherm since returning home. The company was struck by tragedy recently when one of its drivers, John Francis Conlon –who was better known as Frank –died in a motorbike crash in Cork. The 41-year-old from Clones was taking part in a hill climb event near Clonakilty on Sunday, September 17 last. A native of Corlough near Ballyconnell, Peter McVitty is equally well-known in the field of politics, being a lifelong member of the Fine Gael party and a member of Cavan County Council since 1999 when he first ran in the Belturbet electoral area. He served as Cavan County Council chairman in 2006/07 and has been involved in many major projects, including the creation of a cross-border Geo park between Cavan and Fermanagh for which he helped secur funding from both the Irish and Northern Irish governments. Peter is also committed to the success of the Cavan Burren Park interpretive centre near Blacklion. Cllr McVitty is also the proud holder of two All-Ireland tug-o-war medals that he won with the Blackrocks team in 1987 and ’90.